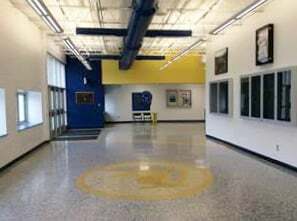 It was that time of year again for the staff at Maine Endwell Middle School to begin planning for their annual art show. As they pulled out each art display board they discovered they were falling apart and quite frankly, they were cumbersome to move. The boards were dragged across the clean tiled floor leaving scuff marks. Their search connected them with Screenflex Portable Room Dividers. 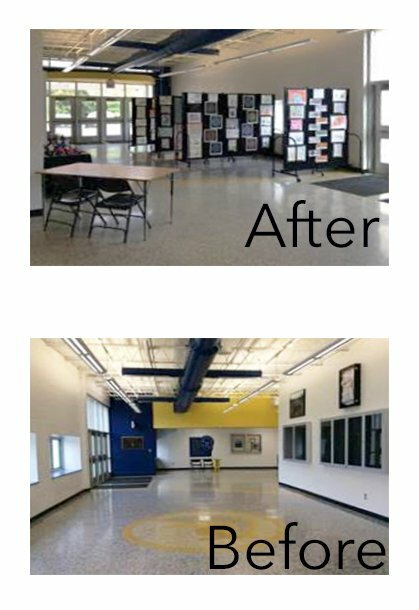 After viewing the photo gallery and seeing how other schools and facilities use Screenflex to display artwork they were sold. From the moment Screenflex art display panels are delivered they are ready to use. Simply remove the sturdy outer cardboard carton and roll into place. The staff remarked at the simplicity of tacking and stapling the artwork to the black fabric panels to both sides of the divider. Guests were able to move freely around the art display boards. 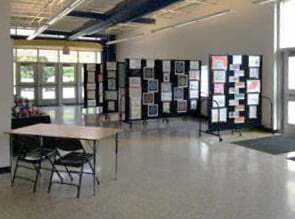 When the art show was over, the artwork was removed from the panels and the dividers moved to another location in the school. Now that’s how to have a successful art show!